It is a text input with slider. 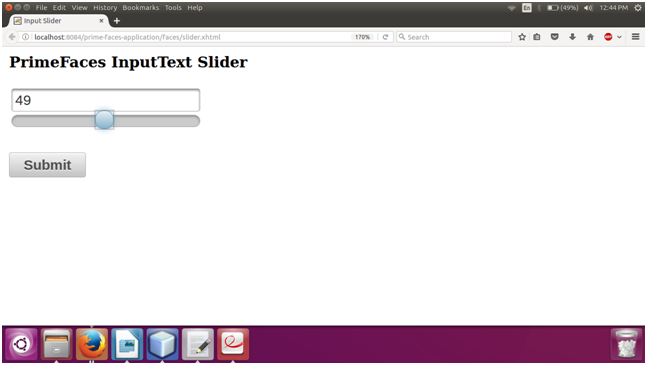 It is used to get user input with the help of slider. It allows us to increment and decrement input by using slider. The <p:slider> component is used to create slider input text. It also has various attributes that are tabled below. minValue 0 Integer It is used to set minimum value of the slider. maxValue 100 Integer It is used to set maximum value of the slider. style null String It is used to set inline CSS of the container element. animate true Boolean It takes boolean value to set enable or disable of the animate feature. type horizontal String It is used to set type of slider. Whether it is horizontal or vertical. step 1 Integer It is used to set steps for the slider. disabled 0 Boolean It is used to disable slider. It takes boolean value. onSlideStart null String It is used to call client script on slider start event. onSlideEnd null String It executes client script on slide end. range false Boolean It is used to provide range. displayTemplate null String It is a string template. Here, in the following example, we are implementing <p:slider> component. This example contains the following files.